The death of Pakistani internet sensation Qandeel Baloch is raising questions about the extent to which her killing may have been the tragic fallout of a much larger attempt by a male-dominated media in that country to snuff out her provocative online persona. Baloch, whose notoriety skyrocketed in recent months, was found dead on Saturday at her family home in Multan. Her brother Waseem Azeem confessed to killing her on Sunday, calling the photos and videos she posted on social media a source of shame. The images that Baloch, who's been called the Pakistani Kim Kardashian, shared and that so many conservatives in Pakistan reviled, became constant fodder for the mainstream media. In the days leading up to her death, and even afterwards, media revelations included intimate details about her past. Until recently, that had all remained hidden under a glamorous veneer. Some Pakistani women argue that Baloch, whose online persona became popular in the last few years, drew little ire from her family until then. ​"For a long time nobody knew what her real name or what her background was and the media outed her. And to me that's an important conversation to have: What role did the media play in making her more vulnerable?" 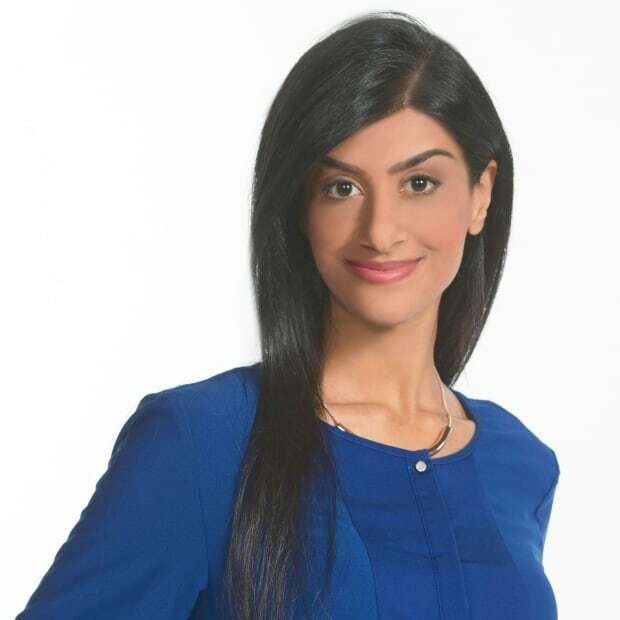 Toronto-based freelance broadcaster Naheed Mustafa told CBC News. Baloch's provocative style — the bikinis, the bare legs, the ridicule of authority — garnered her 40,000 followers on Twitter, 700,000 on Facebook and a reputation as a party girl. That's something that some who watch Pakistani media closely say was used to justify clawing into her private life to fight against a voice that Pakistan's more conservative elements would have found repugnant. That clawing become more aggressive in recent weeks after Baloch posted a selfie with Pakistani cleric Mufti Abdul Qavi showing them in a Karachi hotel room. Qavi went on national television later making threats against her and is being investigated for a possible role in Baloch's death. "She had been around for a couple of years and no one from her family had a problem with what she was doing," journalist Bina Shah told CBC News from Karachi. "But when the scandal with this Mufti broke out, the mainstream media went and investigated her and found out her real name, aired details of herself, her family." One group of Pakistani women says the actions of local commentators, journalists and politicians prepared the way for Baloch's death. "They mocked her and dismissed her and leaked her details when she was alive and now that she's dead, they're commodifying her death," Madiha Tahir, co-founder of the feminist magazine Tanqeed (Critique), told CBC News. Tahir is part of a Pakistani women's organization called the Feminist Collective, which she says has several hundred members. She and two other members of the collective, Ghazah Abbasi and Zoya Rehman, created a website called No Country for Bold Women as a kind of "wall of shame" documenting the ways in which they say Baloch was consistently picked apart by a media that apparently loved to hate her. 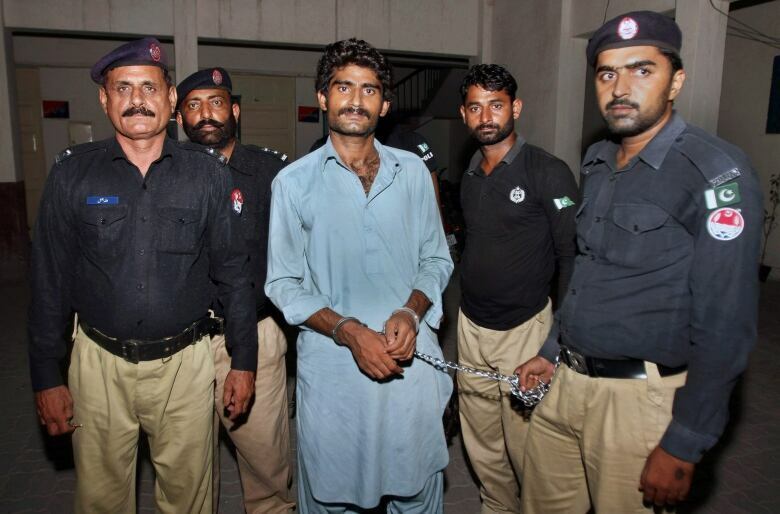 "Although Waseem is the killer, the mainstream media paved the way," the website says. Their collection of content runs the gamut from salacious news articles and tweets of condemnation to video footage of an apparently lifeless Baloch, whose real name was Fouzia Azeem. Its title: "Qandeel Baloch dead body (real video)." "This is an effort — to create a public memory that's bigger than just her brother. It's a way to actually begin to hold these journalists accountable and look at the manner in which they savaged this woman," Tahir said, speaking from Islamabad. A 2015 report on Pakistan's media landscape by the International Federation of Journalists found "widespread evidence of both print and broadcast media asserting and perpetuating negative stereotypes of girls and women," with the number of women in decision-making positions in the industry negligible. The report calls the need for action to combat gender insensitivity in Pakistani media "urgent." In reality, Fouzia was unexceptional. She was the picture of working-class Pakistan, coming from a poor family in the Punjab region, divorced, a single mother, Pakistani author Rafia Zakaria said. But rather than becoming invisible in what Zakaria describes as a highly patriarchal society, Fouzia was unapologetic for her audacious online personality. "Here you have someone who's pushing the boundaries within that realm and claiming that virtual space for herself and for Pakistani women," Zakaria said. That, she says, is what made Baloch exceptional. "I think what was truly notable about her was that she was self-made. "She was interested in being part of a global conversation around women and in that sense social media gave her that platform." "Social media gave her a sense of democratic space in the sense that 'This wasn't somebody's property, this was my page; I have the right to say this on my page,' " Tahir said. While her online persona was one of independence and glamour, she would always remain working-class, unable to speak the sort of flawless English that the Pakistani elite flaunt as an indicator of class, Zakaria said. "In that sense, a lot of what she was doing was aspirational," said Mustafa, who works in and whose family is from Pakistan. "She was copying the things that she saw were successful in this particular kind of media environment that we're in now. But she didn't have the pedigree." That lack of pedigree ultimately meant that Baloch would never have the social standing that might have shielded her from the media's onslaught, Mustafa said. In recent months, the narrative got away from her, Tahir said. "It somehow became OK for the male-dominated mainstream media to put out these salacious details about her. They took it upon themselves to humiliate her." Days before her death, Baloch spoke out to Pakistani media to address rumours about her personal life. "Media is not supporting me…. What about my self-worth? My identity?" she said in an interview with major Pakistani paper, Dawn, speaking candidly about a man she says she was forced to marry and who beat her, and the child she had to surrender to him. 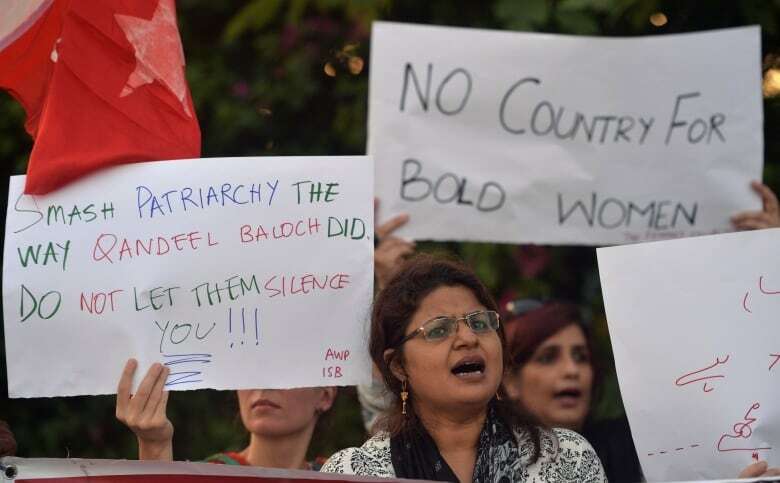 Tahir said she had seen Baloch's posts on social media in which she professed to be a symbol of female empowerment, but like many, she didn't quite take her seriously. "You hear those things but you don't necessarily pay attention to them when they're coming unfortunately from an entertainer," Tahir said. "I went back and looked at her Facebook page. Everything that she had been putting out there, suddenly it wasn't just a game anymore, we read it in a different light; it became very serious very fast," Tahir said. "She understood what she was doing as a political and a feminist act." But whether that act will change attitudes in Pakistan remains a question after Baloch's death. On Monday, dozens of Pakistani women took to the streets of Islamabad to protest her killing. "We like to think that somebody didn't die in vain," Mustafa said, but she isn't so sure. "Increasingly there's a class of women like Qandeel Baloch that don't give a damn about honour and reputation and all of those constraints that used to exist in Pakistan," she said, adding Baloch's audacious personality and death has given voice to them. Perhaps in her death, she'll generate more conversations than in life. "The media isn't giving me any credit for speaking about empowerment of women, girl power," Baloch said in her final interview with local media. "They don't recognize that this girl fought."